Lunch with Champagne or Champagne for Lunch: I keep changing my mind what to call this painting. It must have something to do with how much Champagne to drink. 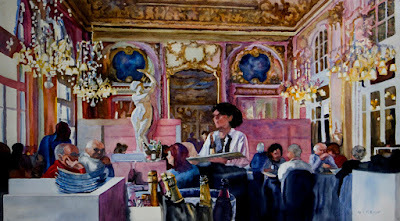 Regardless which title, this painting is a celebration of light: direct light from the windows, the glow of chandeliers, the reflections on champagne bottles, reflections on the interior windows, and the shadowed area through the distant door that hides mysteries of more amazing art sequestered in the restaurant at Musee D'Orsay. It's a wonderful place to enjoy the amazing art on display, including sculpture and ornate murals on the walls and ceiling. This restaurant hummed with activity and definitely hit the spot from a culinary perspective as well. Of course what else would you expect in Paris. 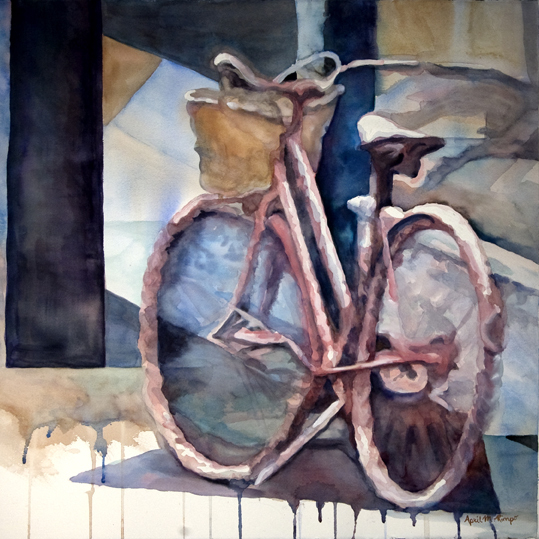 This painting was also included in the 2017 Baltimore Watercolor Society's Mid-Atlantic Regional Exhibition. Then in 2018 it found its way into Splash 19, North Light Publishers' the 2018 Edition of their Best of Watercolor book series. I consider this publication nirvana in the world of watercolor. I was one of 126 artists selected for the publications from a field of over 1700. I feel giddy, like maybe I've been drinking too much Champagne. Now I'm delighted it will grace a new home, having been purchased through HorseSpirit Arts Gallery. 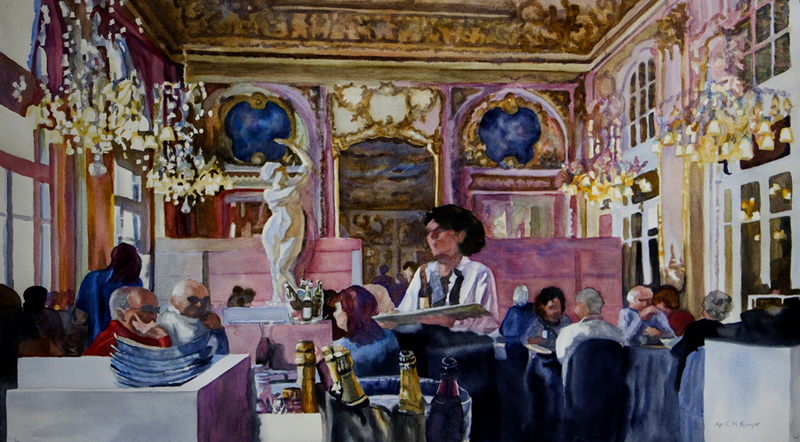 I hope to be able to obtain a photograph of "Champagne for Lunch" in their home. 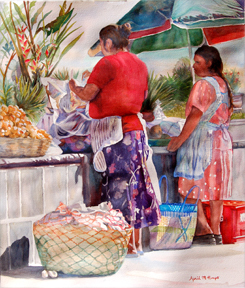 Fruit Vendors is based on a photograph taken in Antigua, Guatemala. 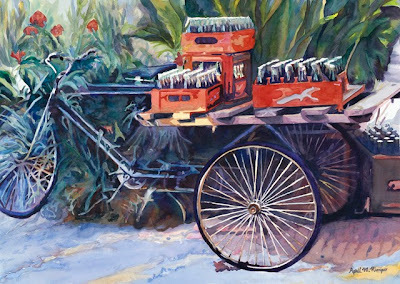 This painting is intended to capture part of everyday life in Guatemala. It was morning and these women were setting up their stand for the day. They were located near a church which was visited by tourists and locals and both appeared to be their clientele. In the background were buildings and people who were at a level above the vendors, that I felt would detract from the vendors and their fruit. I started with a design that had very little in the background, but as the painting developed I decided I needed to have more to balance with the front of the painting. My first revision was to add some plants to the background on the left side. I placed them all at about the same height because I thought the umbrella should be the only item that went to the top of the painting. However as the painting progressed I felt the woman on the right was off by herself with only a few items of fruit in front of her. There was a large empty gap between the fruit and her that went up to the umbrella. So I decided to add a few plants on her side of the painting. This proved to be not enough. The top still felt quite empty and really needed something dark in the upper left quadrant of the painting. I decided to research plants native to Guatemala. I found one called “Heliconia Wagneriana” that had dark stems, long leaves, and great blossoms that had the same reddish orange I used in several other place within the painting. These plants grow from 5 to 15 feet tall, so they were a good candidate to fill the space. I found a few different photographs of this plant then drew it to fill in the space that I thought would balance the design. I think the addition of this plant did the trick. What do you think? I'd love to hear from you. 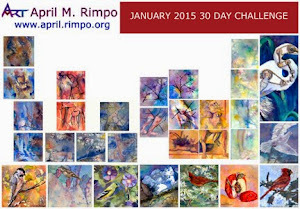 To see other work by April visit her website at http://www.rimpo.org/april/ where you can shop for card or prints.